010 (Zero-One-Zero) and 101 (One-Zero-One) are Bynars assigned to Outpost 112 through a Foreign Exchange Program. They serve as engineers on both Federation Outpost 112 and K7 Space Station. The Bynars are a race of humanoids native to the planet Bynaus in the Beta Magellan system. The Bynars are shorter in height than most humanoids and have lilac skin and enlarged skulls. 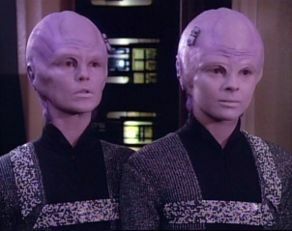 Their most definitive characteristic is that they are interconnected with a master computer on Bynaus. When a Bynar is born, a surgeon removes the child's parietal lobe and replaces it with a synaptic processor. One Zero: "It is a great pleasure…"
Zero One: "…to work on such a large mobile computer." When they speak to each other, they use a high-frequency sound that is unintelligible to Humans. Every Bynar is equipped with a buffer to manage this rate of information transfer. 010 and 101 are simply referred to as "Zero" (the former) and "One" (the latter).